FREE ENTRANCE TO THE WELLNESS CENTRE: Adults that stay in the President have free use of the multifunctional heated sea water pools with hydro-massage jets (upon reservation), Turkish bath and a relaxation area by the sea. 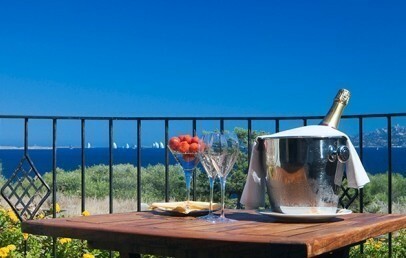 The Capo d’Orso Hotel Thalasso & Spa is a secluded location that allows real intimate moment. The property is located in a private bay with private dock, so it is suitable for those who love travel by boat for day trips. Recommended for couples of all ages who want to pamper themselves and enjoy moments of relaxation in a breathtaking location. Excellent cuisine accompanied by the finest regional and national wines. 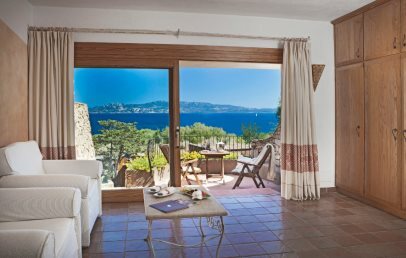 The Capo d’Orso Hotel Thalasso & SPA is located in the prestigious Cala Capra bay, a completely unspoilt corner of Sardinia. 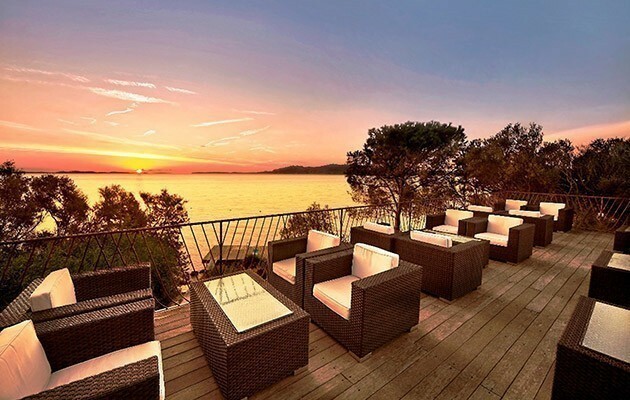 It is certainly one of the most beautiful destination on the island, on one side the Archipelago of La Maddalena and on the other side the famous Costa Smeralda. A romantic and exclusive hotel, hidden from olive and juniper trees in a 10-hectare park with several small bays around and a little marina close by. It has its own peculiar charm and offers many different services as for example, having breakfast under the shadow of the trees with relaxing harp melodies, the golf course and the Thalasso & Spa Centre only a few steps from the sea. Palau distance only 4 km and Olbia around 40 km. With its own little harbour, the Capo d’Orso Hotel Thalasso & SPA, part of the Delphina Hotels & Resort, is an elegant and simple hotel, set in a fascinating place, where the profusion of nature has been respected thoroughly, only few metres away from the most crystal clear waters of Sardinia. The hotel boasts a salt water swimming pool, surrounded by a wood pavement close to the reefs, just a few meters away from the sea. In total there are 86 rooms among 20 Junior Suites, one prestigious President Suite and 20 charming and elegant Junior Suites Executive and Cardinal (the latters are located close to the Thalasso & Spa Centre L’Incantu). The Junior Suite Cardinal have also a direct access to the Wellness Centre and are located only a few steps from the sea and the sun terraces. 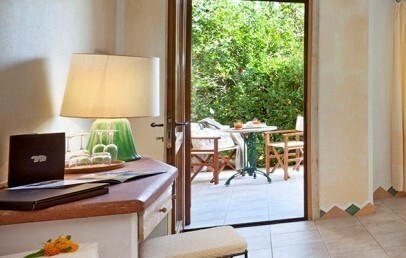 All rooms are decorated with the typical Sardinian style by renowned interior decorators and equipped with balcony or terraces with table and chairs, bathroom with shower, air conditioning, TV, hairdryer, safe, minibar, beach towels and bathrobes for adults. A tea courtesy set is available in room only on request. Single room – bedroom with queen-size bed. Deluxe – double bedroom, with lounge area and a sofa bed. 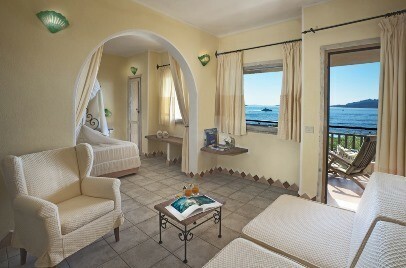 Deluxe Cardinalino Sea View - close to the wellness center. Junior Suite – double bedroom (twin beds only on request) and lounge area with sofa bed; two bathrooms (one with shower and washbasin and the other with WC, bidet, washbasin). Possibility to add a cot. Suite Family – double room, lounge area with armchair or sofa bed + second small bedroom with twin beds. 1 bathroom and 2 TVs. Junior Suite Executive – double bedroom (twin beds only upon request) with lounge area with two sofa beds, wide and refined bathrooms with separated bathtub and shower. Junior Suite Cardinal – like the Junior Suite Executive but more spacious, with a walk-in wardrobe, direct access to the park of the Wellness Centre, only 30 meters from the sea and the sun terraces. President Sea View – prestigious wide room with walk-in wardrobe, separated lounge with a table and two sofa beds, spacious bathroom with jacuzzi, chromotherapy shower and second bathroom with wash-basin, WC and bidet. Panoramic veranda with gorgeous 180° view. Possibility to add a cot. 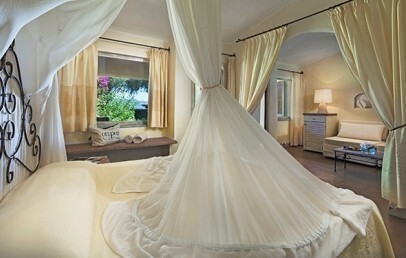 On the two sides of the hotel there are two sandy beaches Cala Capra and Cala Servaggia, one is equipped with loungers. The hotel guests can also enjoy relaxing sunbaths on one of the 5 wood-made solarium provided with sun chairs, set directly on the sea shore. Moreover between the hotel and lighthouse guests might enjoy a little walk, hence to discover the bays and hidden coves. The Thalasso & Spa Centre: L'Incantu is set a few metres from the sea and it offers some nice wellness packages and personalized treatments. The centre has 2 Thalasso pools with sea water set at a different temperature with whirlpools, cabins and outdoor gazebo for Thalasso treatments and massages, Turkish bath and relax area. Price: € 40,00 per person (half day): free use of the Thalasso pools, Turkish bath and relax area. Guests staying in the President Suite Sea View have free access to the Thalasso Centre (wet zone), reservation required. The Spa is open 6 days a week. Upon booking you may request to our booking assistants further information about all the available packages at L'Incantu; it will be our pleasure to advice and book for you the best treatment that will complete your wellness holiday package. 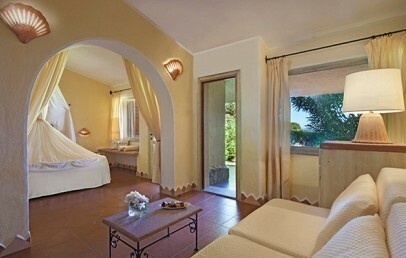 Capo d'Orso Hotel Thalasso & SPA offers a half board formula with breakfast and dinner included. The delightful dishes are carefully prepared by the excellent chefs who follow the traditional Mediterranean recipes. The breakfast buffet is served on the terrace from 7.30 am to 10.30. Il Paguro (table service) welcomes its guests on a wide terrace with view over the sea, specialised in grilled food. Gli Olivastri (buffet) proposes the typical dishes of the island tradition, served on the shadowed terrace of a very old tree. Île Flottante (with surcharge) on unique location, on the water with exclusive à-la-carte chef's suggestions. Furthermore delicious pizzas, baked in a wood oven, at the L'Approdo. Lunch is served at the à-la-carte restaurant Il Paguro, where the chefs propose different fish-based recipes and at L'Approdo, a few steps from the beach, can be enjoyed a light lunch with cold plates, salads and sandwiches. On request are gluten-free, dairy free dishes (reservation is required). A Pitch & Putt 9-hole course with driving range is available for the guests. Professional players might enjoy the PAR3, while beginners might book some private lessons, free of charge for youth up to 13 years only from June, 2nd. A gym with cardio-vascular equipment is available for the workout. Golf lessons for young guests up to 13 years old; free Wi-Fi connection in the rooms, in the reception area, at "Il Paguro" restaurant area and at the bar "L'Approdo"; evening piano bar; gym; loungers at the beach; private parking unattended (garage on request with extra charge). Private Heliport. Paid services are: Thalasso & SPA Centre “L'Incantu”; boat and car rental, excursions, sailing lessons, diving centre, golf (starting from 14 years old). Free Wi-Fi in the rooms and in the following areas: reception-bar, restaurant "Il Paguro" and the bar "L’Approdo"
A comfortable double room, tastefully furnished by well-known architects in typical Sardinian style. The private bathroom has the shower, hairdryer, beach towel and bathrobes for adults. The rooms have a veranda equipped with table and chairs with garden view. Comfortable room for one adult. 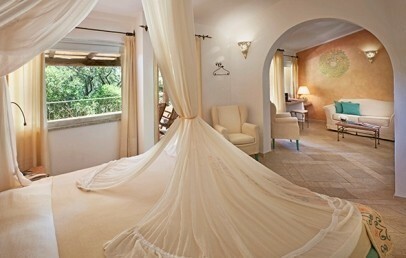 It is tastefully furnished by well-known architects in the typical Sardinian style. The private bathroom has a shower, a hair dryer, a beach towel and bathrobe for adults. All have an equipped garden view veranda with table and chairs. Simple and cosy double room with a lounge area equipped with a sofa bed for a third adult (up to 14 years old). It is tastefully furnished by well-known architects in typical Sardinian style. The private bathroom has the shower, hairdryer, beach towel and bathrobes for adults. The Deluxe rooms have a veranda with garden view, equipped with table and chairs. Simple and cosy double room with a lounge area equipped with a sofa bed for a third adult (up to 14 years old). It is tastefully furnished by well-known architects in typical Sardinian style. The private bathroom has the shower, hairdryer, beach towel and bathrobes for adults. 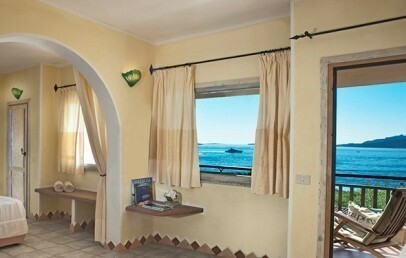 The Deluxe rooms have a veranda with a sea view, equipped with table and chairs. Simple double room, tastefully furnished by well-known architects in typical Sardinian style. The private bathroom has a shower, hairdryer, beach towels and bathrobes for adults. The rooms have a veranda equipped with table and chairs with sea view. Open space Junior Suite consisting of a lounge area with sofa bed and the possibility to add a cot (for infant aged 0-1), on request. 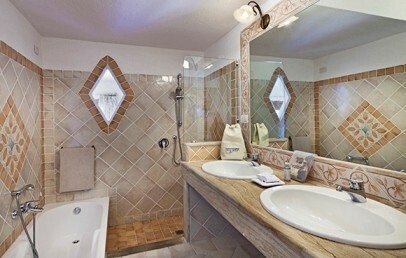 It is tastefully furnished by well-known architects in typical Sardinian style. Bathroom with shower and a separate toilet. Hairdryer, beach towels and bathrobes for adults are available for guests. The Junior Suite rooms have a garden view veranda, equipped with table and chairs. Open space Suite with possibility of accommodating a second child (age 0-1) on request. 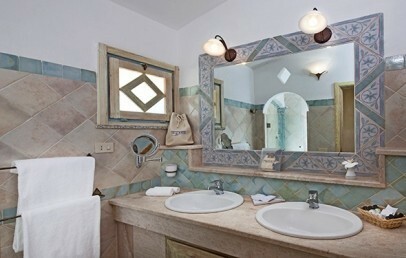 It is tastefully furnished by well-known architects in typical Sardinian style. It consists of a lounge area with sofa bed. Bathroom with shower and a toilet. Hairdryer, beach towels and bathrobes for adults are available for guests. The Junior Suite rooms have a sea view veranda, equipped with table and chairs. 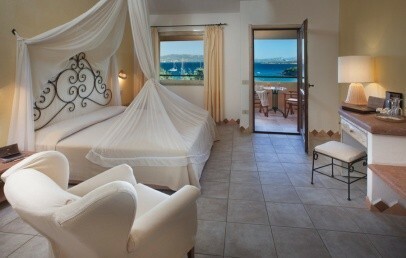 Open space Junior Suite Executive tastefully furnished by well-known architects in typical Sardinian style. It consists of a lounge area with 2 armchairs bed. The large bathroom has a shower and a separated bathtub, hairdryer, beach towel and bathrobes for adults are available for guests. The Executive Junior Suites have a sea view veranda, equipped with table and chairs.